Do we need Healthcare Without Borders? ​Maneesh Juneja, a “Digital Health Futurist”, in this “Healthcare without borders?” article highlights some common misconceptions about the value of Mobile video ​consults with Doctors so I thought it might be helpful to share my views. 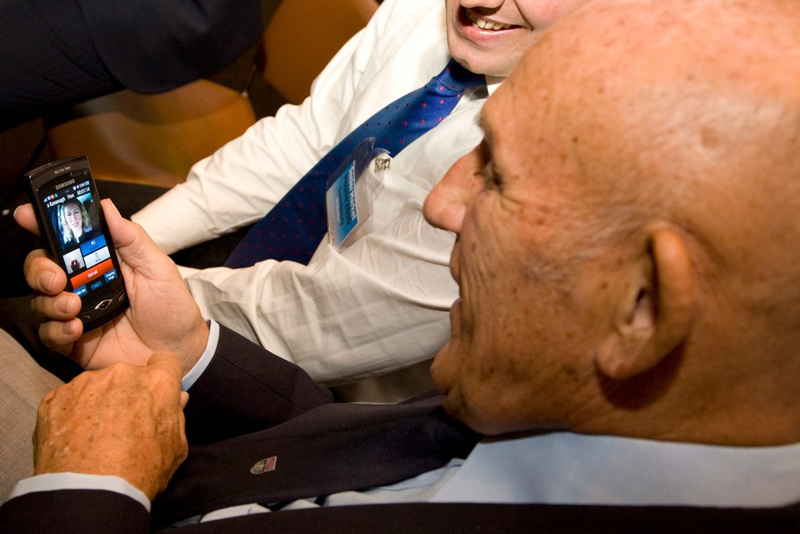 Perhaps Maneesh just needs to get some good tech help – check out a pic of Sir Stirling Moss making a 3G video call to 3G Doctor in 2010. I find it funny to see how commonplace it’s become today eg. in Dublin look up at any bus and you’ll see a tourist on the bus FaceTime calling their friends/family back home while they see the sights (no doubt this has been aided by Dublin bus making a smart move to provide customers with free WiFi). I think it’s important we all realise that the 2000 year old office visit model is simply no longer viable. It amazes me that anyone would think it would make sense to be conducting undocumented consults in exactly the same style that we’ve been doing for 2000 years now that we all have mobile phones in our pockets that are more powerful than supercomputers from a few years ago. Surely we all can see Mobile has transformed banking into something that looks nothing like it did when we grew up, so why does anyone in 2015 think that mobile will not transform how we consult with Healthcare Professionals? Now that we can collapse time and space why would we always want to share information with Doctors within rushed in-office moments and do we really think Patients are going to tolerate being told by their Doctors that they’re wasting their time while their dog gets more joined up care than their child simply because of their lack of industry interest in adopting the tools of our time? ​I went into this topic in more detail in the talk I gave at Doctors20 ​in Paris last year. Since reading about how Glen Tullman’s son Sam FaceTime called their Doctor in 2012 I presumed Patients who are paying expensive subsciptions to access primary care services in the US were already being offered FaceTime access? It’s a complete mystery to me as to why anyone would think that the SMS protocol that hasn’t changed a whole lot since being designed for telco engineers 20+ years ago is some ideal platform for Patients to use to interact with a team of Doctors. It should be obvious that unless there’s an emotional connection and context (eg. a reason/need, etc) there’s little need for video calling. That’s why you see people just demoing the tech they just feel the need to wave at each other (eg. remember when Steve Jobs FaceTime called Jonny Ives at the launch) whereas in other uses of the same technology it’s hard to explain in words the value of the video connection. Perhaps this service in the USA isn’t accessible to Carers (it’s not clear if the employees who have subscriptions are allowed to use the service to get help for their grandparents etc?) or the Patients subscribing to this service are mostly using the services to help them with technical aspects of accessing insurer provided care (this is a big issue due to the complexity of insurance coverage and lack of Primary Care in the USA). Since I visited the NHS GP Clinic of Dr Tony Stern more than 5 years ago it’s been incredibly obvious to me: if you’re able bodied and aren’t too sick to get out of bed and already have a relationship with a Doctor the need for video calling that Doctor isn’t going to be that great because you already have all the trust etc. But the problem most Patients face is that they don’t have convenient enough access to their Doctor because of demands on Doctor time and the lack of resources being provided to GPs to do their job eg. this is why AskMyGP is proving such a success as it lets Patients asynchronously communicate with their Doctor in a way that doesn’t completely disrupt the GPs workflow. But it’s a very different story if you are someone who doesn’t already have a Doctor/Patient relationship or have a relationship that you don’t want to run the risk of ruining by confronting them based on some conflicting advice that you have read online etc. If you want citizens to share their most sensitive private information and you’re going to make it possible based on that shared information to select the most appropriate Doctor for that Patients specific needs (which of course means they will have never met or have even heard of the Doctor they’ll be consulting with) you’re going to immediately see the value that Patients will take from every opportunity you provide with them to judge the Doctor because after all the whole point of the exercise is for the Patient to be able to accept an opinion and some advice that they’ll then feel confident enough to act on. It’s terrible that India doesn’t have legislation in place to prevent Doctors from exposing Patient data and to close Doctors like this down but it stuns me that a HIMSS publication is sharing such bad practice without making that clear to the reader. This is the same age old problem encountered widely eg. with the NHS’s NHS reDirect and 111 services that Patients would spend 30 mins describing their concerns to before getting some advice over the telephone which all amounted to nothing when they were referred to A&E or a Doctor appointment as they’d have to rinse and repeat the whole history taking process once again. This whole idea of having the first visit always in person is something the Doctor associations and regulators seem to be very keen on but I think it’s a really outdated concept that will only really serve to prevent society from benefiting from mHealth. I can’t even imagine how such legislation might serve Doctors well eg. surely Patients would just bridge the gap by jumping on WhatsApp etc to insecurely consult with Doctors in India? They might as well legislate that Patients need to see a Doctor before doing a search for health information. I used to explain this point to Doctors but in 2015 it’s getting obvious that most Doctors would learn more about Patients by looking at their Facebook ads than the billing record that they refer to as an EHR. I think this supposedly positive review is great until you actually want to know IF the prescription was needed. With the over/inappropriate prescription of medicines like antibiotics and pain killers being a real problem the world over we need to be responsible and ensure that medications are being prescribed responsibly. I think medicine will go in some very bad directions if provider organisations are benefiting from public ratings that praise them for readily prescribing medications. I think the refund of charge is a good fix here but this app rating mechanism also shows the value of having a feedback process and it’s worth noting that the vast majority of in-office consultations don’t come with that (one notable exception is in the UK where NHS England have made the Friends and Family Test a contractual requirement for all practices since 1st December last year). Note: at 3G Doctor these video troubles aren’t issues as we provide Patients with asynchronous communication before the consult starts eg. all consults are followed up with a private means of providing feedback and if the consulting Doctor felt there would be any need to review images they would be able to request them from the Patient BEFORE the consultation ever started. ​This just again highlights the need to use clinically validated interactive Questionnaires before online consulting makes any sense. At 3G Doctor we’re always having to refuse to consult Patients from around the world because UK/Irish Doctors have such a great reputation (unfortunately licensing/insurance regulations don’t permit this) and it’s obvious the Chinese mobile operators have been eyeing this opportunity for years but I think the challenge is not in a future where healthcare is provided without borders but in one were we modernise the regulations. It’s hard to overestimate the value of local knowledge and practice and there are far too many charlatans abusing Patients for us to even think about making it easier for more dodgy quacks to do business. Regulat​ions might feel outdated at times but they’ve got us to where we are and it would be a colossal mistake to throw away all the benefits they provide Patients and Carers with. What do you think: Do we need Healthcare Without Borders?